Mar Joseph Arumachadath was born on 10 April 1960 at Uppukandam, in the Erattayar parish of the present Diocese of Idukki, in Idukki District, Kerala as the son of Mr. Thomas and Mrs. Mariakutty. After his High School education, he joined the Missionary Congregation of the Blessed Sacrament in 1978. His religious profession in MCBS was on 17-5-1981 and priestly ordination on 7th May 1988. He did his philosophy at St. Joseph’s Pontifical Seminary, Alwaye and theology at Jnana Deepa Vidyapeeth, Pune. He has a Doctorate from Leuven University in Theology and has published his thesis “The Church as community of Jesus’ disciples.” After his ordination he served for two years in the Retreat Team in Sannidhanam Ashram, at Illithode, and later as secretary to the Superior General. From 1999 to 2002 he was the Rector of the MCBS Minor Seminary at Athirumpuzha. From 2002 to 2005 he was the provincial superior of the Emmaus Province of MCBS. While working as the Vice-Rector of Sanathana Seminary, Thamarasserry, he was appointed the First Bishop of the newly erected eparchy of Bhadravathi on 21 August 2007. The official announcement took place on 29 August 2007. 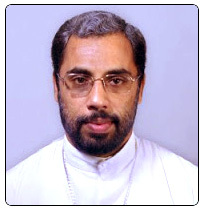 He was ordained Bishop on 25 October 2007 at Bhadravathi by His Beatitude Varkey Cardinal Vithayathil, the Major Archbishop of the Syro-Malabar Church and was enthroned on the same day by the Major Archbishop himself.